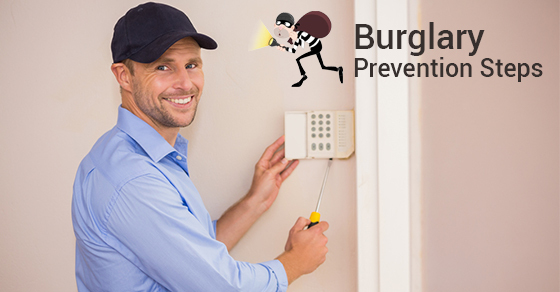 5 Steps To Complete Burglary Prevention | Calgary Alarm Inc.
Burglaries are usually very selective acts. Thieves will case a home or a business they think looks vulnerable and easy to get in and out of quickly without being caught. Buildings that look, or even seem well protected are seldom targeted because of the potential legal repercussions if caught. The high pitched noise of a home alarm sounding is enough to make most would-be thieves take flight. Normally when you purchase one these systems, they come with signage and advertising you are able to place around your home, notifying anyone thinking of attempting a break-in that you have security measures in place to stop them and notify the authorities if they wish to try their luck. Drill a quarter inch hole on a slight downward angle through the inside window frame and halfway into the outside frame and place a nail in the hole. Most windows can be fortified in this way against a break in. Make your home look occupied while you are away. Thieves are on constant lookout for homes whose owners are out of town. If you are going to be away for an extended period of time, making your home look occupied is a necessity. There are certain home security devices that even simulate noises and timers you can set to have lights come on at certain times of the day to make it seem like you just returned home from work or from shopping. Additionally, make sure your lawn is mowed and mail is not left piling up. Push button locks on outside doors are far too easy to overcome. Doors leading outside should have deadbolts installed for added security and perhaps a push button or door-knob lock in addition to the deadbolt. Motion sensitive floodlights for the backyard or around the garage are massive deterrents. The knowledge that a thief no longer has the cover of darkness under which to operate is often enough to dissuade most thieves from moving forward with their plans to break into your home or business. Burglary in Calgary happens, and the statistics for just how often it does are surprising. Knowing how to protect your home, business, family and belongings is mandatory. Follow the above five steps to complete burglary prevention and make sure you have your bases covered.